After looking at the calendar and realizing I only have 4 Mondays this month, I suddenly regret featuring my trip to the West. I should have waited one more month! Oh well, I’m going to try and make today and next Monday absolutely worth it. After a quick overnighter in Page, Arizona, Annie and I were off yet again on another day chock full of adventure. To start we visited a place not far at all from Page, Horseshoe Bend. We arrived just in time for the sun to erupt over the rim of the canyon so my photos from there were fairly lackluster. Especially considering some of the grand photographs of the area. It’s incredibly popular after all, I believe there were around 30 other people there at the time we were. We enjoyed the morning light on the canyon and watched a “small” boat make its way around the horseshoe bend and then we were off; our destination was Zion National Park. The plan today was to take a detour down Cottonwood Canyon Road, which goes through the Grand Staircase-Escalante National Monument, then right by Kodachrome Basin, and finally puts you in easy access to Bryce National Park. Three epic locations for amazing exploration and photography. Luckily for us, upon arriving at Cottonwood Canyon Road we were greeted by a “Road Closed” sign. I say lucky, because that means we literally had the entire route to ourselves! I’m not one to follow passive aggressive “authority”, so we quickly made our way around the sign and continued on one of the coolest offroad drives I’ve ever been on. Cottonwood Canyon Road is a barely maintained dirt road which follows Cottonwood Creek through the Escalante National Monument and traverses one of the coolest mountain formations I’ve ever seen: the Cockscomb. It had many interesting sights along the way, and being the only two individuals out there made it all that more exciting. We stopped halfway through the drive at one of the canyons along the way and hiked back into it a bit. Seeing as it was late January, there was still a lot of snow left on the ground where the sun never touches in the canyons. It was neat to see painted desert and then random bits of snow. After our journey down Cottonwood Canyon road we made our way by Bryce National Park, enjoyed the views from the road, then continued to our final destination for the day: the East Mesa Trail just outside of the east side of the park at Zion. We would have loved to explore Kodachrome and Bryce more, but our plan for the day involved us hiking a 3.5 mile trail to the top of Observation Point overlooking Zion. I’m one for solitude and after reading Joe Braun’s description of this hike, I knew that Annie and I would have a very high chance of being the only two people at this specific location. It’s a 7 mile hike after a treacherous 4wd only trail to even get to the trailhead, and the other trail which meets up with the observation point trail requires an elevation climb of nearly 2,500ft! I’ve done my fair share of 1,000ft climbs here in Arkansas, but couldn’t imagine climbing that much elevation, especially at the altitude we were already at. 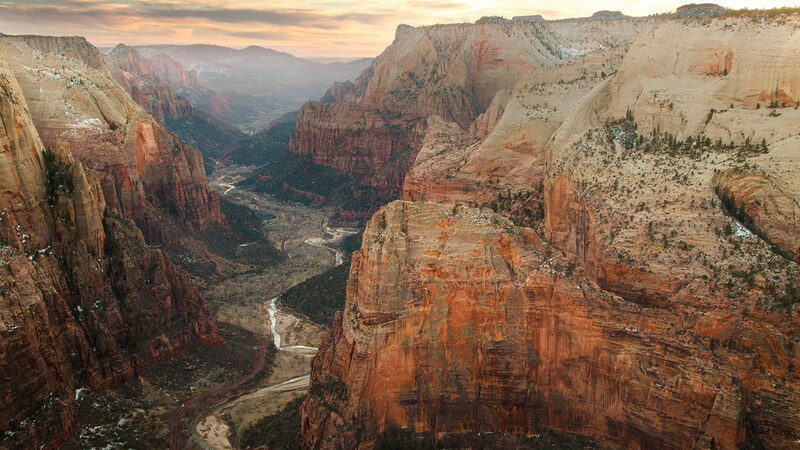 Us Arkansas folk are used to 0-1000ft above sea level, not 4000+ which is typical of Zion. Needless to say, we were the only ones there, and it was spectacular being able to enjoy this view all to ourselves. We sat there for nearly 2 hours waiting for sunset to brew and it turned out to be fairly decent. While waiting we enjoyed a shouting match with nearby hikers out on Angel Wing (the peak mid-center and middle of the valley). They are actually in this photograph, but are impossible to see on any screen without zooming in! The scale of this place is inspiring, look carefully on the road lower left and you can see cars as they weave their way through the canyon, majestic hardly describes it. We thoroughly enjoyed the experience, however enjoying sunset at this location meant hiking out in the dark! 3.5 miles in the dark in mountain lion, wolf, and bear country isn’t for the faint of heart! We started our hike back just after the sun had set over the rim of the canyon and shortly after this photograph was taken. It got dark fast. About 30 minutes into the hike back and still a mile and a half to go, I held up my head to look further down the trail and my eyes met with those of an animal enveloped in pitch black. The shining gaze pierced through my soul, my heart dropped, and my stomach jumped. Annie was around 30ft behind me and I waved her back. I was preparing myself for what I could only imagine would be a fight to the death with a hungry wolf or worse, a mountain lion. I hoisted my 20lb tripod off my back and held it in my hand, whilst staring at those eyes which brightly reflected the light from my headlamp. I gathered the courage to walk forward, knowing it was the only way. After a few more steps, a few menacing bellows from my lungs, and an unwavering creature of the night. I finally was close enough to make out that there was… a very dumbfounded mule deer! I can only imagine what this deer was thinking, two lights bobbing through the night, and then some scary sounding yelling, I imagine he was just as scared as I was. I shouted back at Annie, “just deer,” and we made our way around them and continued our hike. Luckily, they didn’t want to bother us, and we were fine leaving them be, so we went our separate ways and now both have stories to tell of our encounter with creatures in the middle of the night. I always tell people that my tripod could kill a bear, but so far I’ve luckily never had to use it. I am absolutely thankful that it was just a deer, much deadlier creatures roam the plateaus around Zion and the forest we were in harbored both bears and mountain lions, as seen from the tracks and droppings. In hindsight, I would highly recommend carrying a firearm into this location! After all was said and done, and we were back to the vehicle, Annie and I had a good laugh at how worried we were about a bunch of deer. The 7 mile hike was incredible and neither or us will ever forget it. If you want to visit Observation Point yourself and are looking for directions to this spectacular location, I used the wonderful photographer, Joe Braun’s, detailed directions which can be found on his website at: http://www.citrusmilo.com/zionguide/eastmesatrail.cfm. I highly recommend this hike, standing above Zion National Park and witnessing the scale for yourself is incredible. It really places your life into perspective.